If you ever wanted to experience war on the open sea in AR, you’ll soon get your chance. Immersion VR’s naval battle game The Ancients AR is now available for pre-order on the App Store! The Ancients AR is a collaborative effort between Immersion VR and renowned artist, painter and illustrator Jakub Różalski. Known for World of 1920+ (an alternate history where diesel-powered war robots are part of the interwar period), Jakub’s captivating art led to the creation of Scythe (board and computer games). He also created concept art for Hollywood productions such as Kong: Skull Island. Now, his artistry blends with augmented reality in the war-torn, fantasy world of The Ancients AR. What started as a VR game moved to mobile to take advantage of ARKit technology. It is your duty to protect the kingdoms by using a fleet of powerful ships. Summon seafaring beasts called “The Ancients” to help wage war against enemies and race towards victory. 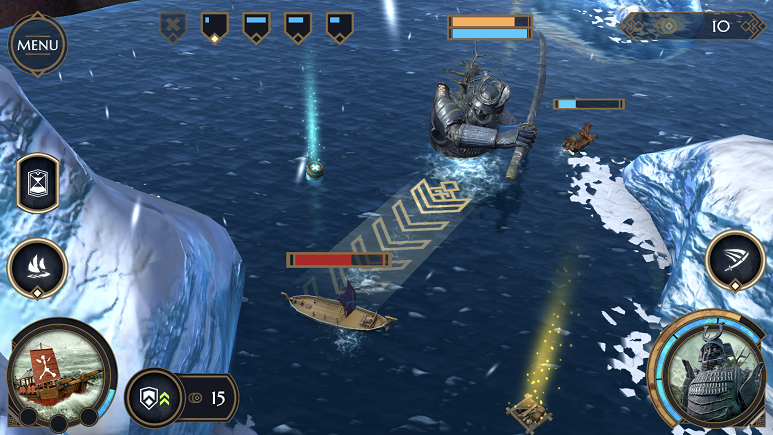 Experience the thrill of cannon fire and capsizing enemy ships in an icy, glacier-filled terrain brought to life with augmented reality — complete with beautiful graphics and gripping gameplay. The Ancients are here! Today, Immersion released their real-time strategy game The Ancients AR for iOS devices. Engage in ferocious sea battles to defend the borders of your kingdom against enemy threats. In addition to managing a fleet of ships, call upon the power of the Ancients – powerful giants summoned from the depths of the ocean. Completing your objectives will require your skill and the Ancients’ strength! Enjoy gorgeous AR visuals as you complete campaigns--created in part with renowned artist, painter, and illustrator Jakub Różalski. Calling all creatives! We have a fanart challenge for you. In Immersion’s real-time strategy game The Ancients AR, the Ancients are mystical beasts who dwell beneath the ocean’s turbulent waters. 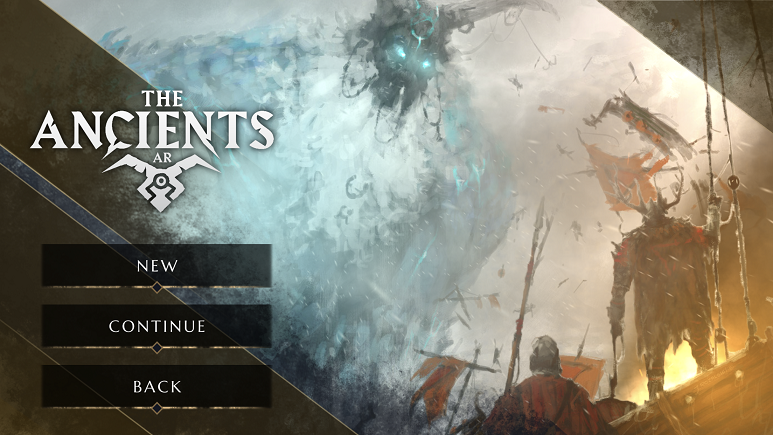 From freezing enemy ships to casting lightning bolts to summoning dragons, the power of the Ancients is a wonder to behold and can help you win your battles. Each Ancient has a distinct look and attack pattern, and now we want to see how you would re-imagine them. You can use the provided images as inspiration or freestyle your design completely. Whether you hand draw it, digitally create it or put something together in photoshop, we want to see your unique take on the might of the Ancients. We’ll select our favorites and post them on The Ancients AR social channels with credit. We’ll also throw in a few download codes for you and your friends. We’re excited to see what you come up with! I want to take a moment to explain why Immersion’s The Ancients AR is different from other AR games. One of the reasons the graphics and effects in The Ancients AR feel so real is the way Immersion went about building the world. The idea started when Immersion’s CEO, Piotr Baczyński, saw renowned artist, painter, and illustrator Jakub Różalski’s work and was inspired by Różalski’s graphics of gigantic creatures. Together, they invented a fantasy world in which The Ancients live in symbiosis with the three island kingdoms that are engaged in an ongoing mutual war. The Ancients are called upon by the people to stand by their side in their fight against their enemy. Różalski has laid down this vision onto the canvas, creating a unique and mysterious fantasy atmosphere. I have not played Ancients AR but the tabletop gaming community is salivating for someone to finally get it right and convert miniature wargames into an AR environment. Could you convert your assets to work in a game more like Game Workshops Man o' War allowing two people to build fleets and fight against each other? This game looks absolutely amazing! This is going to be super popular with people who love tabletops.